Current Kuga production accounts for about half the output at Ford's factory in Valencia, Spain. MADRID -- Ford will invest more than 750 million euros ($885 million) in its factory in Valencia, eastern Spain, to produce the next-generation Kuga SUV. The Valencia plant employs more than 8,000 people and, in addition to the Kuga, makes the Mondeo and S-Max alongside the Tourneo and Transit commercial vans, according to Automotive News Europe's car assembly plant map. Kuga production represents nearly half of the output at the Valencia plant. The Kuga is Ford's No. 3-selling nameplate in Europe behind the Fiesta and Focus. 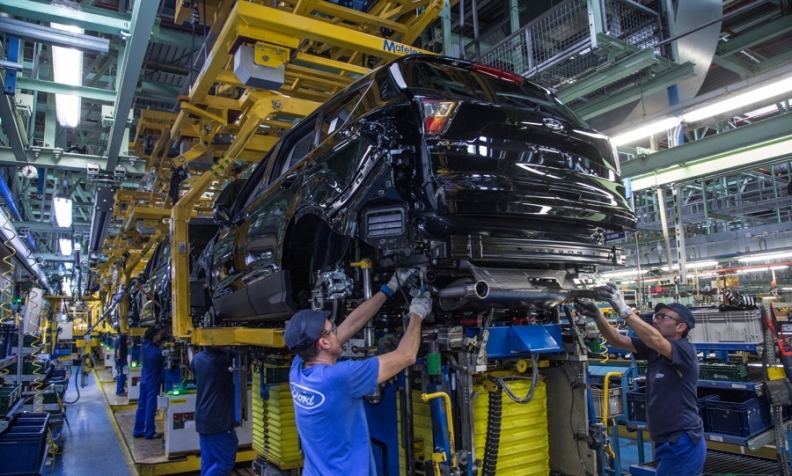 Ford has invested around 3 billion euros in upgrades at the plant over the past six years, making Valencia one of the two largest assembly operations in Ford's global manufacturing system, alongside the Chongqing factory in China. "This significant investment underlines Ford's commitment to Spain as one of its most important manufacturing sites in Europe," the company said in a statement. The investment in the Spanish plant continues a trend of auto production moving south or east in Europe, where wages tend to be lower. Spain's car industry, including auto parts manufacturers, employs just under 300,000 people, according to official statistics. It accounts for about 7 percent of the country's economic output, according to the vehicle manufacturing association Anfac.